Scenic hillsides, a meandering river, stone bridges, and picturesque buildings, all characteristics that make up the landscape of Bronxville, are the same features that have attracted artists to create memorable canvases for several generations. Although most observers associate Bronxville’s artistic heritage with the well known late-nineteenth-century Lawrence Park colony, the history of the village as a place where artists lived, painted, sculpted, and found patronage originated much earlier in the 1800s. 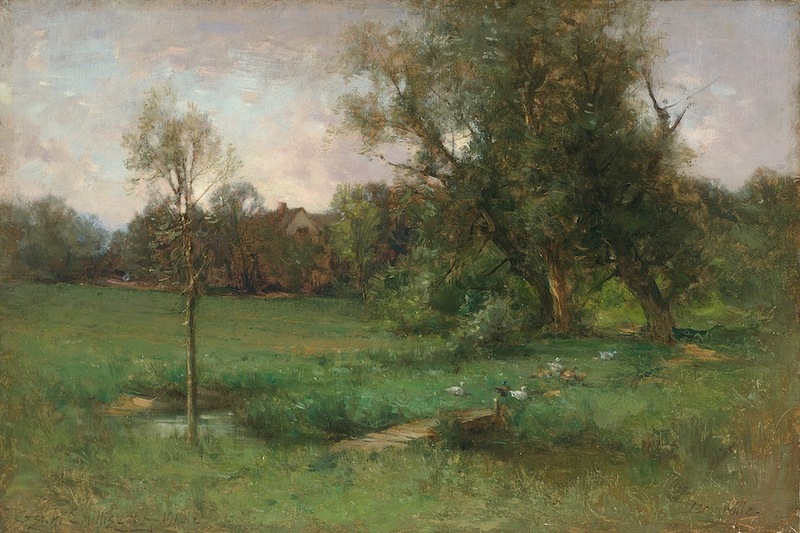 Alexander Masterton, a name invariably included in any discussion of village social, political, and economic life in the first half of the nineteenth century, was also instrumental in bringing to the area the community’s earliest known artists. When Masterton established his attractive homestead on White Plains Road in the mid-1830s, he adorned the formal entertaining rooms with artwork, especially portraits and landscapes. His artist of choice was William R. Hamilton, who is known to have created approximately a dozen canvases related to Bronxville in the 1830s. Masterton was also influential in bringing to Bronxville the community’s most renowned nineteenth-century artist when he assisted Francis William Edmonds with the purchase of property and oversaw the building of his Crow’s Nest estate. Drawn by the bucolic setting and opportunity for country living, Edmonds soon found inspiration in the local landscape and village life. At the same time, his fellow artists of the Hudson River School, such as Asher B. Durand, John Casilear, and Edward Nelson, made excursions to the area to visit and paint with Edmonds. Edmonds was unusual in having a dual career in art and finance, and among his business interests was a bank note engraving company that he formed with James Smillie, a New York engraver. Partner Smillie was the father of George Smillie, who would later move to Bronxville and become a part of the Lawrence Park community of artists, creating a link with the village’s earlier art heritage. Most of the art in the Conservancy’s collection is from this prolific group of Lawrence Park artists who are today experiencing a renaissance of popularity in the larger art market. For the local villager, however, the value of the paintings may lie more in their pleasing canvases that create nostalgic scenes from our community’s past, the role they play in enhancing the artistic heritage of Bronxville, and, more importantly, the legacy they provide for future villagers. As the Centennial Celebration came to a close in 1998, the leadership of that memorable event turned their attention to creating an historical organization that would capture and build on the spirit of that year. The Bronxville Historical Conservancy was created with a mission statement that envisioned the future work of the organization. Central to that vision was preserving and strengthening the artistic, architectural and cultural heritage of the village. Aware of the community’s rich history of resident artists, the board members, like many villagers, bemoaned the fact that very few artworks by earlier area artists were known to be in the village. Motivated to “bring back to Bronxville” the art of former local artists, the Conservancy established a committee to research, locate and catalogue the works of these individuals in hopes that some might eventually become part of both public and private collections in Bronxville. The final step in creating a collection for the village was finding a suitable exhibit space where the public could view and enjoy the artwork. Fortuitously, the expansion of Village Hall coincided with the creation of the Conservancy’s collection. This building project, described by its innovative architect as a “transformation” rather than a restoration or renovation, gave the BHC artwork its home. With respect for the civic building’s past and a vision for its future, corridors, lobbies and other public rooms were redesigned to function as gallery space, thus investing Village Hall with a new purpose and spirit for its citizenry.